This piece is entitled "Freefall" in recognition and/or celebration of both the craziness of the stock market and earmarking the season. These are gingko leaves in motion. 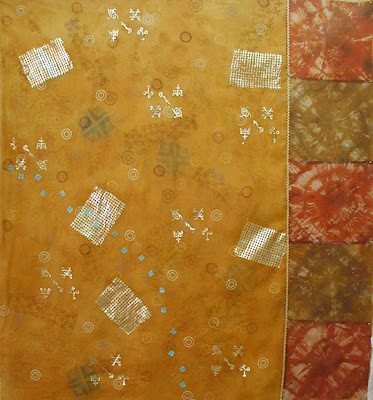 The panels on the right have gingko leaves in gold leaf--not foil--leaf. The leaves on the left side are done as thread lace. Except for some tuille, every bit of those leaves were done with freemotion stitching. Except for a couple of sashing pieces all was hand-dyed silk. I love the rich intensity of colors. This piece is still in progress. There is more than one layer. 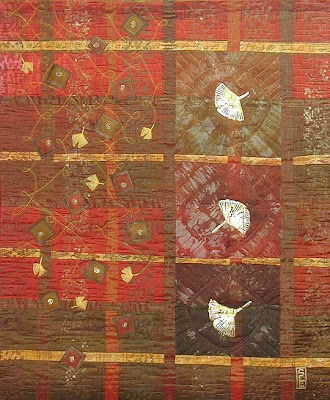 The bottom later is noil that has been dyed and painted with stamps and silk screens. The top layer is divided into 2 main sections. 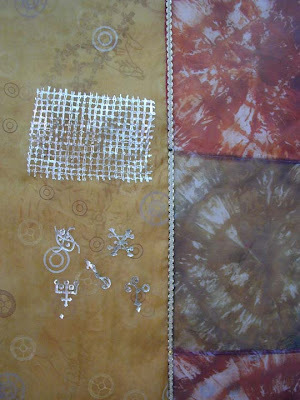 The left is dyed and painted silk organza. 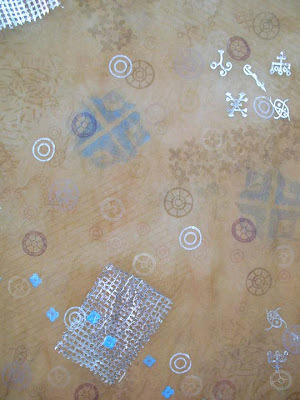 In addition, I have used gold leaf to add the alchemy symbols and the woven patch. The right side is also silk organza. 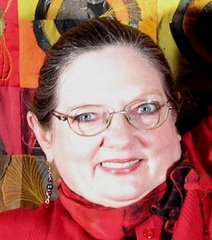 It is using more of the pieces I dyed last year when I dyed the fabric for the previous piece (Freefall). The sections have not been assembled with batting yet. I have no idea yet how I'll quilt it. Here you can get a better idea of the layers. All those circles were printed using a few of my dozens of empty spools. Another detail showing the right side. After last night's election and Obama's speech I am feeling more optimistic about life in general and especially our future as a country. By the way-- the name of this piece is "Energy of Hope". I have no idea where this piece is going. 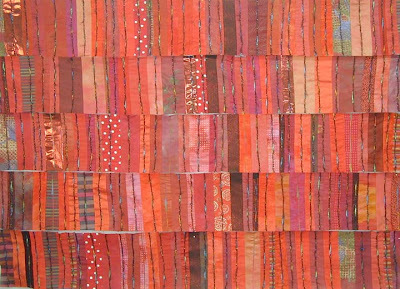 It is made up of many of my scraps from previous circle quilts. I added a line of multi-colored couched yarn. This, so far, is just pinned to the wall in rows. I am not sure yet whether it'll be vertically oriented or horizonally. I, for sure, have no idea how to quilt it. So, while I have been in my studio feeling somewhat aimless, I have found all sorts of directions to investigate. If has been fun. I think I'll go back to celebrating and drinking in that warm glow of hope. I remember that feeling. It has been a while. I liked it a lot. Jon will be home tomorrow with his CD completed and ready for publication. This is a landmark event in our lives and I expect that forever after our lives will reflect the changes this CD will have wrought.